Everyone has their favourites. Whether it’s their favourite actor, director or brand of cereal. Life’s eclectic like that. Me? Well, I’d struggle to pick out a single actor; I’ve got way too many favourites. Cereal? Well, I’m not really a cereal fan, but I’d go with something containing almonds and is crunchy enough to break at least five teeth per serving. As for director? Well, that’s quite easy: Quentin Tarantino. The guy has had his hand in some of my all time favourite movies and has also propelled certain actors into the ranks of my favourites too, owing to his screenplays. So when a new Tarantino movie rolls into town, I sit up and take notice, as they nearly always guarantee a slice of cinematic gold. Can Django Unchained continue the trend? Before I get down to brass tacks, let’s discuss the premise of this particular movie… as if you don’t already know! 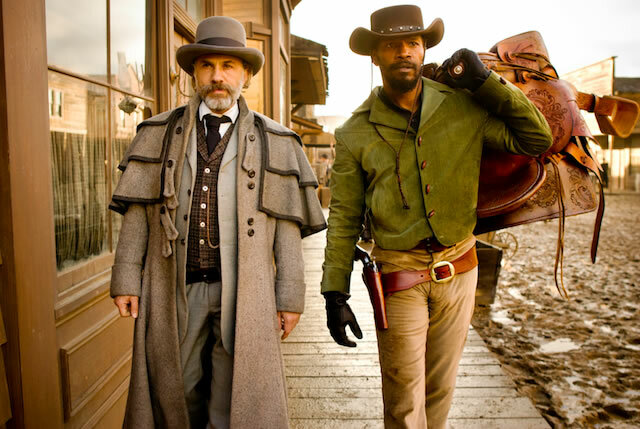 The film follows the life of the titular Django (Jamie Foxx) – a slave who is liberated by a dentist-come-bounty hunter, Dr. King Schultz (Christoph Waltz), in order to track down three targets. But what does Django want to do when the task is accomplished? Well, he wants to go off and find his wife Broomhilda (Kerry Washington) – a fellow slave of the pre-Civil War United States. It just happens to be that Broomhilda is the property of a Calvin Candie (Leonardo DiCaprio): owner of the appropriately named Candie-Land plantation. Can the dynamic duo rescue her from his clutches? 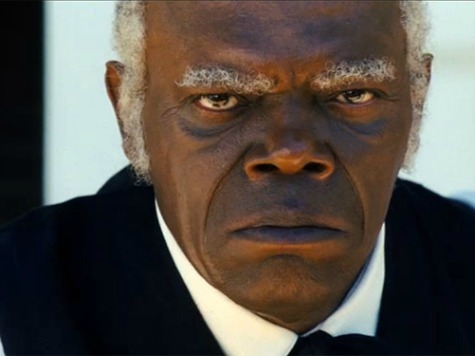 Or will Stephen (Samuel L. Jackson) the loyal house slave, figure out their game? Quite simply, Django Unchained is a formidable work of cinema. It won’t be to everyone’s tastes, but I loved every last moment of it. It had the perfect storm of great plot and fantastic casting, complete with Tarantino‘s brilliant scripting flourishes. So let’s kick off with the acting skills on show here. Much was made of the casting of Django himself, with Will Smith apparently in the running for the part in the early days. This made a lot of people sit up and take notice; owing to Smith‘s established fan base and ability to make massive returns at the box office. But for whatever reason, he never tried out for the part. This led to the hiring of Jamie Foxx for the role. Whilst Foxx isn’t the brightest star in the film, he fits the role perfectly. He’s just “right” for the part – he’s a fit, both physically and vocally. For me, his portrayal of Django was spot on. But as I say, he’s not the eclipsing star here. That accolade in fact belongs to three supporting actors: Christoph Waltz, Leonardo DiCaprio and Samuel L. Jackson. Waltz is bankable. He was sublime in Inglorious Basterds and put on a great show in Carnage. He’s a talent to be reckoned with. Whilst I found the role of King Schultz to be compelling, I never felt the same “wow” as I did with Inglorious Basterds‘ Hans Lander. Still, you can’t fault his performance here. I think I was most impressed with Leonardo DiCaprio, though I’m not surprised. For too long this guy was seen as a flash in the pan – only famous because of Titanic and how much the ladies loved him. But nothing could be further from the truth. He’s shown us countless times how he can step up to any role, so it was great to see him as a detestable character. Candie is sinister, intelligent and at the same time, incredibly naive. DiCaprio pulls it all off with aplomb. Finally, it’s brilliant to see Samuel L. Jackson in another defining role. As I’ve mentioned previously, it seems the guy picks films out of a hat, as opposed to scrutinising a script, as some of his films have been less than palatable. But Tarantino again brings the best out of Jackson. Just like Joss Whedon has his favourite rotating cast, I’m glad that Tarantino has the same. It’s familiar, but it’s always different… if you understand me. Plot / script-wise… it’s Tarantino. Come on – you know what you’re getting here. Ultra-violence, a heap of beautifully crafted dialogue and some great music choices. Some have derided the choice to include Rick Ross‘ 1000 Black Coffins (a modern hip hop song) in the middle of a film smattered with oldie-worldie sounding tunes. But it works! Come on, you can’t say you weren’t surprised to hear “Stuck in the Middle With You” during Reservoir Dogs can you? It was a massive juxtaposition – a guy’s ear being cut off with a cut throat razor with such a jolly song over the top. The same is true here, I’d argue. The one thing that is definitely very “un-Tarantino” is the fact that he opts for a chronological story. We’re all well accustomed to his flair for Chapters in his films – ones that switch back and forth in time. They’re oddly absent here – something that must have been a deliberate choice on his behalf, of that I’m certain. Oh, and anyone spot the massive tie in to the rest of the Tarantino universe? You know – where he makes a nod to a certain character / event in another of his films? No? Yes? It’s three points for a correct answer… OK, here’s a clue: King Schultz. Now go back and watch Kill Bill Vol. 2 with that in mind. All should become apparent. Now, my verdict was never going to be an obvious choice based solely on the fact that Tarantino is the man writing the script, but it certainly raises expectations. Expectations can either be met, exceeded or never met. But Django Unchained never wanes and never bores over its lengthy run time. If anything, I’d have loved more time with those characters in their world. 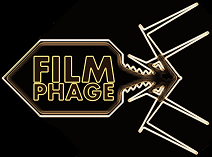 As I say, it’ll have its detractors, but what film doesn’t? This entry was posted in Review and tagged Award nominated, Christoph Waltz, Django, Inglorious Basterds, Jamie Foxx, Kerry Washington, Kill Bill, Leonardo DiCaprio, Quentin Tarantino, Samuel L. Jackson, Schultz, slavery, Tarantino, Will Smith. Bookmark the permalink. I thoroughly enjoyed Django….the script I felt was razor sharp and delivered wonderfully by all the cast. The KKK scene with them moaning about the eye holes was comic genius! Totally agreed – I’m pretty sure I’ll be heading out to see it again at some point too. Sterling film. Completely forgot to mention the humour in the review, but that part was fantastic. Slightly strange cameo from Jonah Hill, but a great scene nevertheless! I’m a huge fan of Tarantino also. I’ve got a page on my site devoted to his work. I also think this is great from start to finish. In some ways I think it’s a great sign that he’s inching closer towards the hearts of the casual film lovers. Nice review! Nice! You definitely need some Reservoir Dogs up there though. Great film! I guess you might have spotted the tie in between Django and the rest of the Tarantino universe then? Of course. I am planning on reviewing Reservoir Gods soon. I love that movie, but I don’t review a film unless it’s fresh in my mind. Great write-up man. Such a good film and shows that QT still has it. Waltz, DiCaprio and Jackson were outstanding. I’ve never doubted the big T. I even enjoyed Death Proof. Sure, it slowed down massively after the initial “accident”, but it’s still a great bit of film. It’s just that it pales in comparison to everything else he’s done. I really can’t wait to see what he tackles next. He’s talked about an Inglorious Basterds sister film and a Kill Bill Vol. 3 when the little girl hits 18. We’ll see! I’d love to see him on sci-fi, but he’s just so damn good at contemporary film. I also enjoyed Death Proof and he’s yet to make a poor film. I do think he’s running out of ideas though but sci-fi or horror would be welcome. Horror would be interesting. I can’t help but feel he’d have done something like Cabin in the Woods if he’d attempted it. An attempt to shake things up. He had his experience in Hostel I guess, but it’d be nice to see one that he’s actually written. Production credits mean ziltch. Can’t go wrong with selecting QT as your favorite director IMO. Really dug this film one of the more fun trips to the theater last year. I wanted to buy a crushed velvet suit and start whipping red necks. Oh me too. It’s probably the first time since Austin Powers that crushed velvet has been a hot topic on the lips of cinema-goers! It’s definitely standing head and shoulders above the other films I’ve seen in recent memory. It won’t win Best Picture, but I’ll be shocked if Waltz doesn’t pick up something.